For over 100 years, dentists have used removable and fixed oral appliances to align teeth in teenagers. In the 1970's, about 75% of children had teeth extracted for late orthodontics, thinking the teeth were too large for the mouth. Now we know more often the mouth is too small for the teeth. So we treat earlier, make space, and extract fewer teeth. Today, only about 25% of children have teeth removed for orthodontics and the number is dropping further as we learn to treat even earlier. 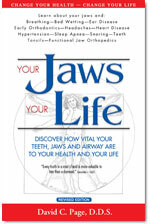 In just 30 years, the average age to start orthodontics in the U.S. dropped from 15 to 11 years old. Techniques and timing differ greatly from practice to practice. Dentists that know how to treat at ages 3 to 8 can reduce extraction rates even further. Two Phase Early Treatment may reduce or eliminate the need for tooth extraction surgery and/or jaw surgery. Phase 1, between the ages of 3-10, for 12-18 months, is used to make space for the bigger adult teeth. Phase 2, if needed, is used to align adult teeth after they grow in, at the ages of 11-16, for 12-18 months. Fees for Two Phase Early Treatment can be much lower than for One Phase Late Treatment. Late treatment can be long, and tooth extractions and surgical fees alone can be very high. Above all, Early Treatment allows time to design a nice broad beautiful smile to use for a lifetime. 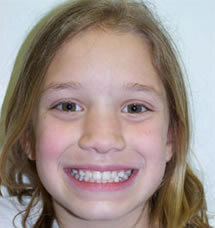 PHASE 1: This young girl had 16 months of active non-surgical Removable & Fixed FJO braces from age 8 to 9. Early FJO treatment made enough space for her adult teeth to grow in. Her smile is much straighter too! 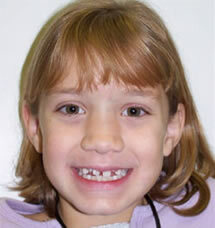 PHASE 2: In 2-3 years after her adult back teeth grow in, she may still need or want 9-15 months of fixed bracket braces. But, she likely will NOT need any teeth removed and NOT need extensive treatment, headgear or jaw surgery. is so important for young children.